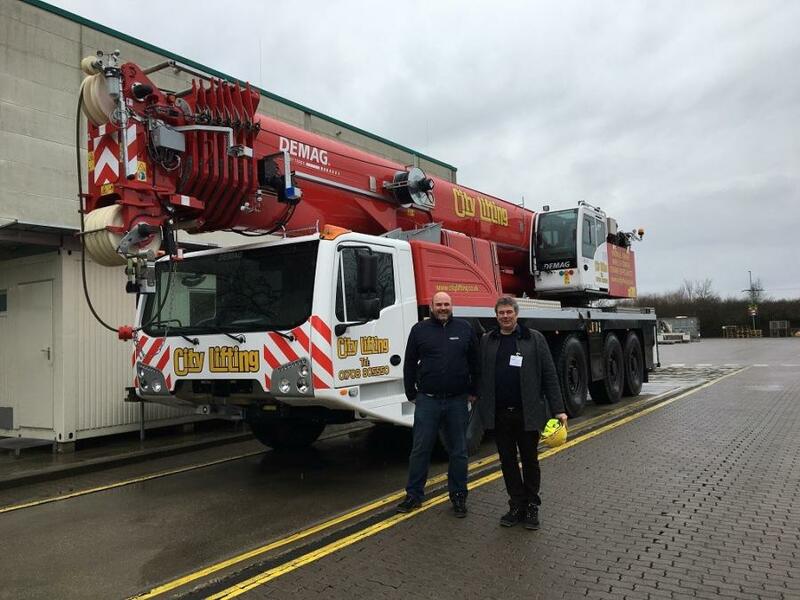 Andrew Snow (L), regional sales manager, Terex Cranes, and Trevor Jepson, owner of City Lifting. City Lifting, a London mobile crane and tower crane hire company, just added a new Demag AC 220-5 all terrain crane to its fleet of 60 mobile cranes. The new 5-axle, 242.5 ton (220-t) capacity class crane is the most compact model in its class with a total length of 47.5 ft. (14.5 m) and carrier width of 9.8 ft. (3 m) to make transport and rigging in a city environment fast and easy. The Demag AC 220-5 crane's maximum main boom length of 256 ft. (78-m) is an excellent asset for City Lifting on challenging jobs and for setting up tower cranes in the city, according to the company. The unit's single-engine concept with an intelligent motor management system also helps reduce operational and maintenance costs. On the job, the crane has excellent maneuverability with the ability to switch between all-axle steering, independent rear axle steering and dynamic launch control. According to City Lifting's Director Claire Jepson, their team also is impressed with how the AC 220-5 crane handles on the job. The company invested in the optional IC-1 Plus control system that delivers real-time calculations of lifting capacities. The AC 220-5 crane is the tenth Demag all terrain crane that City Lifting has purchased in recent years. Both of City Lifting owners say that the level service they receive, and the quality of the machines Terex Cranes manufacturers are the reasons why they continue to invest in Demag all terrain cranes.